Metal Blade’s 35th Anniversary tour rolled into the House of Blues last night with a package of five bands headlined by deathcore stalwarts Whitechapel. Word to the wise, get there early. I arrived a few minutes after 8pm and Goatwhore was halfway through their set. I only managed to catch four songs and missed Necromancing the Stone and Allegaeon. Doors were listed for 6pm, I can only assume the music starts at 6:30?!? Seriously, my grandparents are still watching the news. What I managed to catch of Goatwhore’s set was brutal. Vocalist Ben Falgoust, a tall and menacing figure, was all over the stage. Banging his head, playing air guitar to guitarist Sammy Duet’s solo’s, and never leaving the audience at peace, Falgoust commanded the crowd. “They say everything is bigger in Texas…let’s see a circle pit,” the singer deadpanned. The crowd responded with fury and soon drinks were flying and bodies were slamming. I saw enough of Goatwhore’s set to piss me off for not seeing the whole thing. Goatwhore @ House of Blues, Photo by J. Kevin Lynch, 2017. San Diego deathgrinders Cattle Decapitation took a scorched earth approach to their set. Pummeling their way through songs like a serial killer on a rampage, the band was proficient and razor sharp in execution. Fronted by vocalist Travis Ryan, the band is comprised of some seriously talented musicians. They’re high energy, even if their bass player plays sitting down. The majority of the set was comprised of songs from 2015’s The Anthropocene Extinction and a few songs each from Monolith of Inhumanity and The Harvest Floor. This was my first time seeing the band live and they exceeded all expectations. Cattle Decapitation @ House of Blues, Photo by J. Kevin Lynch, 2017. Recently celebrating their 10th anniversary, Whitechapel hit the stage to a crowd who had been more than warmed up by the support bands. At this point, the crowds enthusiasm was as strong as it had been all night. Not familiar with Whitechapel’s material, I wasn’t sure what to expect. But, I was impressed by the crowds reaction when they hit the stage and struck their first chord. Mosh pits churned, crowd surfing was abundant, and Whitechapel’s energy was relentless. Vocalist Phil Bozeman, frequently standing on one or two foot tall platform, orchestrated the songs and the audience in tandem. The band played a couple of tracks from last years Mark of the Blade, as well as selections across their previous four albums. For a Wednesday night, they certainly treated the crowd to a strong, riff-heavy set that likely left ears ringing for hours later. 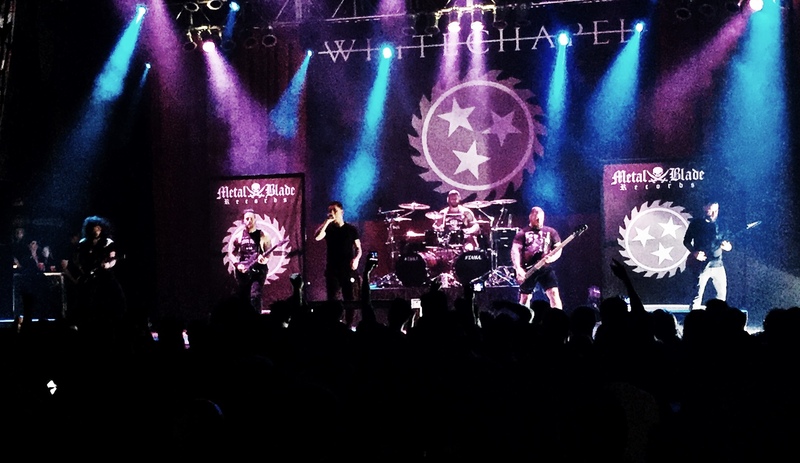 Whitechapel @ House of Blues. Photo by J. Kevin Lynch, 2017. The tour wraps tonight in New Orleans at the House of Blues. Get there early if you want to see each band.